You will normally find that dark brown room always looks heavy as well as distressing, but if you have the right kind of accessories and decorative materials you would be able to decorate the room into a vintage, warm and also looking very sophisticated. It does not matter whether your dark brown room is a small room, if you manage to create a nice kind of brown shade, the room will look welcoming not only to you, but also to whomever who enters the room. As for vintage rooms, it is usually much smaller that modern rooms that you see nowadays. In this case, you will definitely want to use neutral colors whenever you want to do any decorating task. By using neutral colors, you would be able to break up the dark brown color of your room and provide you with a much lighter feeling. First thing that you need to do is to take your slipcovers that come with a cream or off-white color to be use as a cover for upholstered furniture located in any room within your house. By having the slipcovers over your furniture, it will create a new look to the furniture. This is definitely inexpensive rather you purchase new furniture completely. In addition, you can also make use of new slipcovers on your sofas and chairs. For those of you who do not have budget, you can simply re-paint your wood furniture like the coffee table or side chairs. Paint them with ivory or even butter yellow paint. If you want to produce an antique look to the furniture, you need to use a brown glaze and it will also help to show off if there are any elaborate carvings on the furniture. 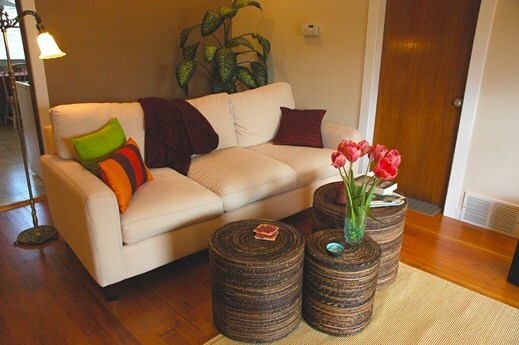 You can also make use of throw pillows and arrange them on your furniture. Try to choose pillows that come with new shade such as sage green, cream, and peach or pink that blends in nicely with dark brown. You can also use throw pillows that have solid colors or designed with small patterns such as plaids or checkers. As for your existing window treatments in your rooms should be replaced with curtains, drapes and swags designed with a paler shade of cream. By using cream color, you would be able to create a clear line between the room’s windows and the dark brown walls. It will also help you to work easily with the vintage look of the room. Another way of decorating a vintage dark brown room is to use a few dark wood pieces that include side tables or end tables and a desk. Your dark brown room can also be decorated using white accent pieces. Simply create a focal point on any wall that you thing appropriate such as by hanging a series of vintage white plates. Other option is by displaying vintage ceramic planters or vases and places them on the sideboard or even decorating them using a few bright-colored pieces in order to match the colors used by your throw pillows. You can also create retro theme for the bedroom with dark brown color. Make it more appealing and create a vintage look by adding polka dots to your walls. You can even use brown comforter that come with light blue polka dots, or vice versa. In order to create a much enhance look to the room, you can hang vintage pictures or posters like classic movie posters or old family photos that you place in an antique brown wood frame on suitable location on your walls. You can also decorate your bedroom into a spa-like retreat by using natural elements with dark brown colors. Your ceiling bedroom can be painted in blue color so that you can reflect the sky. Use white paint to create the clouds just by using a sponge. As for the walls, you can also paint them with solid shade of calm light blue. Create a natural look through the usage of wood furniture that has iron hardware. In addition, you can also install an eco-friendly bamboo floor, plus also create mini waterfalls to add more calm feeling into the room. Whenever you feel that your small vintage room is too dark, you should break out the color of your paint. For example, you can add architectural charm into the room by using elaborate moldings. For those of you who have high ceilings, make use of the ceiling by installing an intricate ceiling medallion. Apart from that, you can also place recessed light right in the middle of you ceiling so that it would like a carving. You might want to place a medallion that has a small hole so that it will not look like the area is missing a chandelier. If you do not like dark Victorian colors, you should just make use of neutral colors instead. In addition, you need to use opulent fabrics to complement the neutral colors such as velvets, silks, along with pillows designed with loads of tassels and beaded fringe. You could also enhanced the look of your taupe room using gold colored fabric or even creating your very own modern color palette for any of your desired room as long as it does not feel stuffy when you are in the room. You should be applying shades of yellow in order to complement your dark brown walls. This will also help you creates a much lighter touch to the room. For example, you can simply use pale shades of yellow. This method helps you to replace your green color located on pillows as well as other decorative items. For those of you who prefer a more sophisticated look, you can make use of black along with white color as the accent colors. You will notice that black and white shades are much bolder and able to turn your brown walls into neutral color.